For those of us who are neurodiverse the frequently comorbid conditions of stress, depression and anxiety often peak at times of populate life transitions. A job search is one such interview transition. Throw in a bit of imposter syndrome and it can be a downward spiral. It does not have to be that way and with a little coaching, you’ll be able to present your best self. Long time readers will know I am a fan of the Manager Tools podcast and the no-nonsense actionable management and career advice they give. Manager Tools also do a product called “Interview Series“. It is not free like the podcast (though some of the content is there for free in the podcast archive) but it is the best $150 you’ll ever spend. The Interview Series covers the whole process from how to create a resume (CV) and cover letter, through interview prep, how to answer common questions and how to follow up after the interview. I normally say it covers all you need to know, but if you are a different thinker you may benefit from some additional advice. This is the bit I struggle with most. Creating a concise, targeted CV and covering letter is a complex feat I can’t get my head around. I know the theory but the practice is hard. When I’ve had interview feedback from jobs I’ve landed (or not) there is a consistent theme around a below average CV. The key to creating a good CV and covering letter is to separate out the evidence collection from the evidence selection and the ultimate wordsmithing. Collecting your achievements is the easy bit. If you have been keeping a log as your career develops. I have guidance on how yo collect achievements on the annual review post. To put your most relevant achievements forward you need to know what the employer is looking for. Review the job description and pick out key points. This is where I break out the mind map. Pick out key words and phrases from the job description and populate them on a mind map. Now go through your career in reverse chronological order (most recent jobs first) and see what you have that matches what is wanted. The person reading your CV and cover letter wants to picture you doing the role they have advertised. If the job you are applying for is leading a small team they probably don’t care that you can do web development (unless that’s what the team is doing). Make all your achievements for the CV and interview prep relevant to the job you are applying for. If you think your time working in a coffee shop or volunteering in scouting is relevant to an application to be a business analyst you will need to spell out why. It might be you determined the workflow for taking orders and serving coffee resulted in long queues so you proposed an alternative procedure that reduced wait times by 10%. As a Scout leader, you might have balanced different stakeholder requirements with the constraints of accessibility for your disabled young people to create an affordable and enjoyable programme of events that also contributed to some key badges. Remove any jargon from your CV. No one knows what project drumbeat was but an employer might be really interested if you reduced costs and improved by synchronising dispersed teams to collaborate on product reviews. This again goes back to helping the person advertising the job see why your experiences and achievements make you a good fit for the role. For more comprehensive guidance on CV creation, I refer back to Manager Tools. I am a strong advocate of disclosing any special requirements early in the job process. Many people worry about how sharing their difficulties may impact their chances and I get that. I naively think the protection of the equalities act should address these concerns but I know for many this is not enough. If you need more convincing do a little research to see if the company was previously part of the Governments Two Tick scheme or is part of the new Disability Confident scheme. This is a powerful signal that the company goes beyond what is legally required to ensure a fair selection process. Get yourself in the right mindset. If you were running a marathon you’d plan out your meal the evening before, your breakfast, you’d lay out your outfit and contemplate your pre-event rituals. An interview is just the same. So consider what you need to do to be on your peak game when the interview comes. If, like me, you struggle with directions then have a dry run of getting to the interview. Find out where you need to be and actually go there and see how long it will take. If it is in a big office building with a shared lobby actually walk in and confirm it is the right building. It is also wise to ask them how long it normally takes to check in visitors at the time you have your interview scheduled. Phone screening is a popular way for employers to get more context than a CV can give with fewer overheads than a formal interview. It might be to clarify specific facts or like a mini interview. It is likely to be scheduled. If you get an unscheduled call you can politely say now is not a great time and ask if you can arrange a time to call back. For a phone (or skype) screen ensure you have a professional sounding voicemail message. “Yo dude leave a message” might not leave the impression you want to create. Find somewhere quiet and distraction free for the phone call. Have a pen and paper with you so you can capture any notes. Have your key achievements to hand as a memory aid. I would have them on post-it notes on the wall and take the call standing up. Apparently, you sound more confident on the phone if you are standing. When the call finishes make a note of what they have asked you and what themes they explored. Cross reference this with the job description to see if there are any themes to help you better prepare for the interview. The selection process may involve psychometric testing or some other form of assessment exercise. 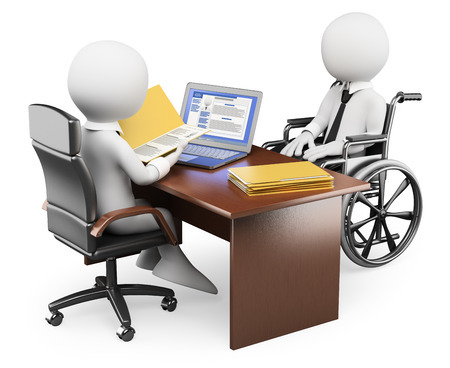 If you have disclosed your neurodiversity you can ask what accommodations they can make for you. This may be things like extra time, text to speech software, or quesiton papers on colours paper. Ask what type of assessment it is that you will be sitting. The web has loads of free sample psychometric tests and full tests for not much money. Performing well in a psychometric test is a learnable skill. If you take a test which gives feedback on wrong answers you can improve your technique. Knowing you can score well helps to reduce anxiety on test day. There is not much neurodiverse specific guidance for in the actual interview. If you followed the Manager Tools guidance you will be well prepared and know how to answer common questions. The only bit extra I’ll add is: if you don’t understand the question ask them to clarify. Don’t answer a similar question as you are unlikely to score well. Interviewers (good ones) will not mind clarifying what they are looking for. Review your performance after the interview. Make a note of any questions you did not expect or that you struggled with. This can help you prepare for other interviews.